Feeling blue? 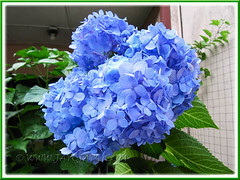 Let the beauty of nature and the Mophead Hydrangea with its gorgeously large blooms mop away the sadness and unhappiness! The colour blue is considered beneficial to the mind and body, and strongly associated with peace, calmness and tranquility. 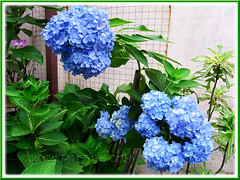 We just love the Blue Hydrangea shrubs that are flourishing so well in our tropical garden. They flower year round and have been blooming their heads off, especially during the whole month of July and into August. How delightful! 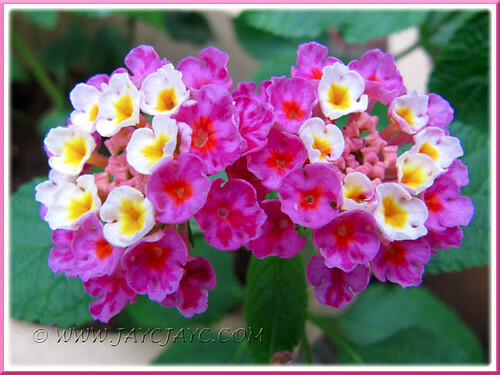 And marvelous too, as we get to enjoy them ‘somewhat endlessly’ since the stunning flower clusters are long-lasting! 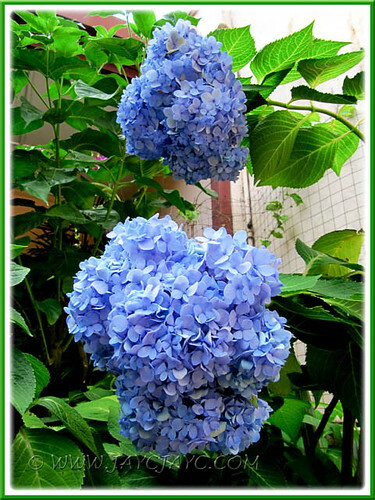 Strolling in our garden, amidst plants and nature, and admiring especially the beautiful blue-coloured and showy large blooms of the Mophead/Bigleaf Hydrangea, that range between 8-10 inches in diameter, can be very therapeutic, calming, comforting and soothing. Similar feeling as looking at blue skies and blue seas to relief stress and attain peace and serenity. This beauty has finally flowered again after a lapse of many years. Wonder what it takes for them to bloom? Probably, a more regular feed will make them more cheerful! We have 3 pots and the other two have never ever flowered for us. Aargh! These are volunteer plants that just love scattering their seeds at every nook and corner. We don’t mind them as they help to fill up garden pots and empty bed spaces. 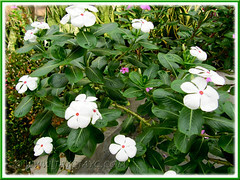 Besides, they’re cheerful bloomers, brightening the landscape with their pretty white faces and red polka dot centers! Hardy plants that thrive with minimum care! 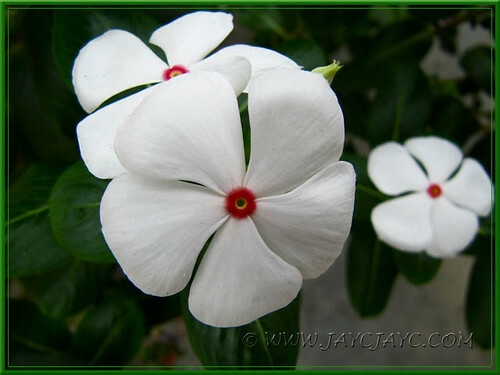 We also grow the very common old-fashioned periwinkle with purplish-pink flowers to keep it company and for additional colour. Butterflies are attracted to these beauties, especially the Peacock Pansy (Junonia almana javana). Just lovely! It was a first-time flowering for these young Lantana plants that were propagated from tip cuttings, less than 2 months ago. For years, Lantana has been a love and hate affair with us. Like butterflies that are attracted to their beautiful and multi-coloured flowers, we too find them magical and irresistible! 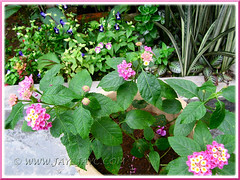 Tempted by their beauty, we have a strong urge to grow them. But when the leaves start to be tainted with fungal brown leaf spots which seem unavoidable and happen ever so frequently, we’ll just thrash them! 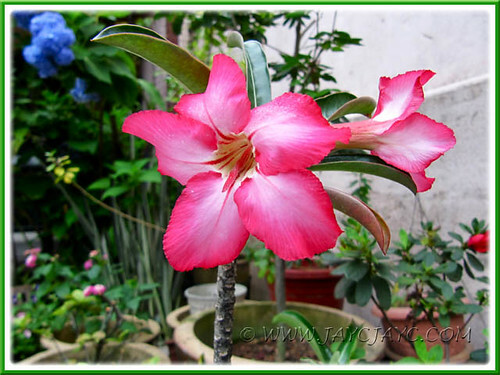 Thus, these plants are never permanent residents of our garden… in and out as quickly! The cheeky squirrel – the homewrecker! 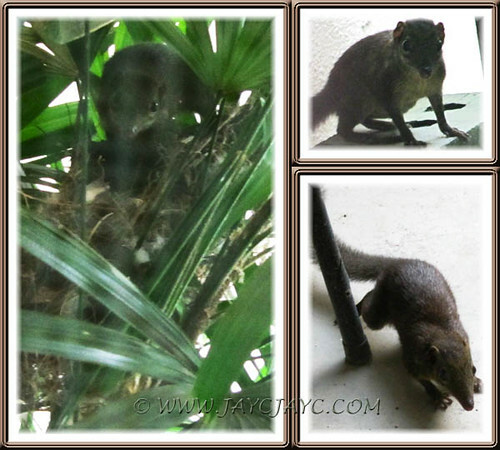 At long last, we finally caught the culprit red-handed, a dark-brown squirrel that was rummaging the bulbuls’ nest which was anchored on our potted Lady Palm trees. Humph… so this was the rascal that had been devouring the bird’s eggs and hatchlings for the past 2 years, depriving the White-browed Yellow-vented Bulbuls of having a family. Not a rat, cat or other predatory birds that we had blamed for the damage done. See how cheeky and bold he was! He glared at me, knowing that I couldn’t reach him with the sliding glass door between us! So sorry for the blurred images, unavoidable as captured from behind the glass door with some reflections. What a brave little creature. It must have been watching you for a while and decided that you were harmless! We cared for one once when we found it had been orphaned. It was very cute and quite attached to us until it was about five weeks old when it decided that we were in its territory! We had to release it then. But it had been an amazing experience. It was while I was researching what to feed it that I found out it’s actually a shrew and is one of the first mammals! One of his cousins is the ever endeavouring character Scrat in the movie Ice Age. Smart too to know he was safe, with me ‘behind bars’, so to speak! Yes, we can get fascinated with them easily and wish them as pets. Thanks for visiting and sharing your experience, Nicol!